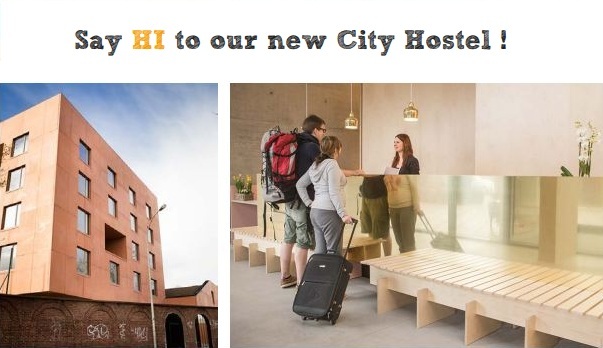 Our new hostel in Kortrijk is officially open! The hostel offers comfortable rooms in a modern, cutting-edge design building, near the city centre, and is a great place to stay for backpackers and young families, schools and international students. 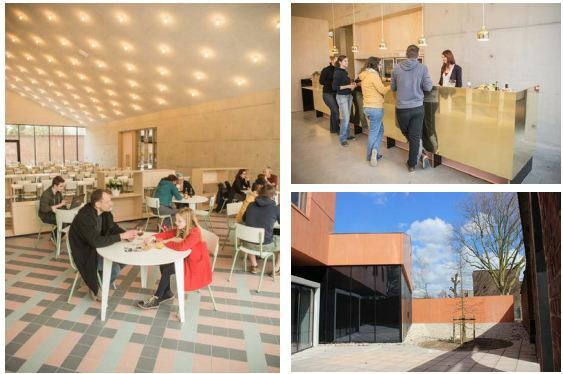 The new hostel has been built on the same site as the old ‘Groeninghe’ hostel, which was closed at the end of 2012. The new building is characterised by its abstract design – its red impressive walls and large square windows. The initial idea came from the old walls, which inspired the new hostel by bringing together the historical and the modern. Openings in the wall lead you to the patio and the entrance of the hostel. All common areas, such as the reception, bar, self-service restaurant and lounge are on the ground floor where light spills in through the large windows. The rooms are located on the upper floors, and each floor has a vista, a recreational area where guests can enjoy great views of the city. A lot of effort went into creating a sustainable and green building. First of all the hostel has been built with durable materials (wood, concrete,…) and is very well insulated. Inside, the hostel has a practical but also energy-saving set-up. All common areas are centralised on the first floor, so this is where most of the action will be during the day. Because of this, Groeninghe hostel opted for floor heating. Beside that there are other green initiatives such as using rainwater to flush the toilets. The hostel has a total capacity of 123 beds, spread over 38 rooms with ensuite bathrooms. 16 of them are private twin rooms and the dorms have 4 or 6 beds. In order to accommodate international students, 5 single rooms have been adjusted for long term stays. The hostel is accessible for wheelchair users and some of the rooms have adapted beds and bathrooms. Other facilities include 2 meeting rooms, a guest kitchen, luggage storage, lockers and free WiFi throughout the entire building. Come and enjoy this modern, comfortable and fun place to stay, tuned to the expectations of the modern traveller. 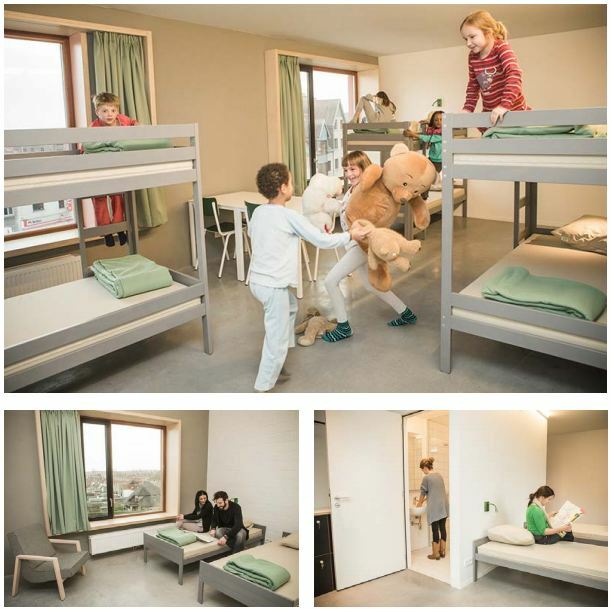 Bag a room at Groeninghe hostel, Kortrijk here. I am really happy to read this blog, I am happy that you people have started a new and eco-friendly concept of Green Hostels. Actually, in present date it has become necessary to make such efforts which can benefit hostlers and also doesn’t harm our environment. I wish that I could also start this new concept soon for my hostel as well in order to provide a better atmosphere for girls living in it. Hello, my name is David Breunesse I am an Australian and am due to be in Lille (Flanders) on the 16th November to get engaged to my lovely girlfriend who lives there in Lille. I plan to stay for some time and am negotiating my long stay visas with Belgium and French Consulates along with a work class B visa with Belgium Consulate. I am seeking part time employment during this time to supplement my stay. So i was wondering if you are in need of any staff that you could perhaps sponsor for a month or two? Wow! That is a really great concept of green hostel. 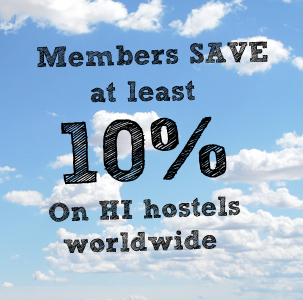 Living in a hostel is a wonderful experience. I still remember my hostel days. The Green hostel concept is favorable for human beings.